It is fair to say that I spend a lot of time looking for the best wireless doorbell options! It was only a matter of time before my Son wanted in…..and I had to start looking for the best wireless doorbell for a kids playhouse! It did pose a few questions though…..
Before we start – here is a quick overview of the 3 best options. For more info on each model, please follow the ‘More Details’ link under each option. How do you fit a wireless doorbell to a playhouse? I say I NEED, but it isn’t strictly true! What functionality will my Son want for the wireless doorbell on his playhouse? Any wireless doorbell for use on a kids playhouse needs to have lots of tunes to choose from! Not only that, the tunes need to be fun….and there definitely needs to be some Christmas tunes in there too! Kids like big buttons. It looks more like a toy and is easier to use for little hands. Another thing kids like is pretty lights, so why not make sure it has a flashing LED? Ok, so this is one that I want! I want to be able to install the wireless doorbell into his playhouse WITHOUT the need for mains electric. That only leaves portable, battery-powered wireless doorbells. The 1byone Easy Chime is totally portable, and has some great tunes that your Kid will love on their playhouse! This is the exact wireless doorbell that I have installed on my Sons playhouse. I also have the plugin version for home too! It is one of the best, cheap, dependable wireless doorbells and the portable option is perfect for a playhouse. IP44 rated push button – because it will need to be outside. 36 chimes, including Christmas music. Portable chime unit, powered by 2 x 1.5AA batteries. LED flash, because kids love lights! 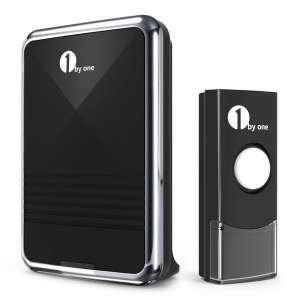 I have had my 1byone for over 1 year and it works, perfectly, every time. It is worth noting that the chime unit is not waterproof, so just make sure it doesn’t leave the playhouse and make sure you fix any leaks! This Fosman wireless doorbell has a large push button that will look awesome on your Kids playhouse! This wireless doorbell option has a very simple design and is excellent for a playhouse! You can easily hook the receiver onto a wall using the screw provided, which means it has a place to stay and (hopefully) will not be moved outside to face the elements. 2 AAA batteries are needed for the receiver by the way…the setup could not be any easier….simply add the batteries and you are done! The push button is the perfect size for small hands too because it gives them plenty to aim at! The push button is also waterproof and rated to IP44, which is awesome for all kinds of rain. The portable wireless doorbell receiver needs 3 x AA batteries for power. As they are not included you will need to purchase the batteries separately. In terms of price, it is a very cheap option, which makes it a great choice for a playhouse. 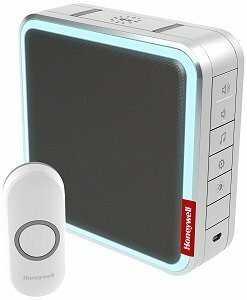 It is a little more expensive, but you can add your own MP3 on this Honeywell portable doorbell to use as a ring tone for your Kids playhouse! 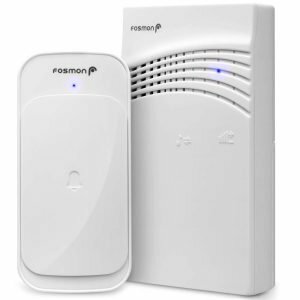 The Honeywell portable wireless doorbell is more expensive than the 1byone and the Fosman above, but for the extra price, you get to add your own chime! The Honeywell looks much better than the other options on this page, and kids will absolutely love the halo LED because you can change the alert color. Something that most wireless doorbells do not offer. The push button is rated to IP44, which means it will work in all kinds of rain. You can also add additional items to the Honeywell too, which means you can have a push button inside your home to call the kids in! If you are going to have a wireless doorbell for your kid’s playhouse, you might as well make it work for you too, right? There is one more option, but it is a little more expensive than the options above because you have to buy two separate things. First, you will need a Starpoint Receiver, which is a battery operated wireless doorbell receiver. Then you will need a Starpoint waterproof transmitter because it will need to be protected from the elements! These two will pair together to make a complete portable wireless doorbell for a kids playhouse. Fitting a wireless doorbell to a kids playhouse is just as easy as fitting one in your home. Simply stick or screw the push button on to the door frame and hang the doorbell receiver inside with a few screws! Some portable witless doorbells have a bracket, which means you will have to fix that to the playhouse wall to hang the receiver. Make sure you have the correct batteries for whichever wireless doorbell you choose! The options above are definitely the best choice if you are looking for a wireless doorbell for a kids playhouse. You can find some of the options here on our wireless doorbell review page. I must admit, it is a challenge to find a good, portable, battery-powered wireless doorbell, which is why I can only recommend the 3 options above! As I have a plugin 1byone at home, it was easy to recommend it as the best option! My Son absolutely loves going out and making pretend deliveries…..sometimes I am the homeowner, and sometimes I am the delivery man! At least it gets him outside for some fresh air. Have you added a doorbell to a playhouse? Which option did you opt for? Please get in touch or leave a comment below to let us know!